Installation is currently possible as follows: get the geekmarks.crx file, Chrome will complain that installing extensions from this website is not allowed, and will just save geekmarks.crx into your Downloads folder. Then, navigate to chrome://extensions/ (you have to copy-paste this URL, sorry), drag-n-drop your previously saved geekmarks.crx file there, and confirm the installation. Why is that so complicated: currently there are issues with publishing the extension on the Chrome Web Store. Firstly it was rejected because it "did not comply with their policy" without clear explanation, then it was going through the compliance review for a few business days, then it was published, and now it's finally taken down again. I find that ridiculous. I really hope that the issues with publishing to the Chrome Web Store will be resolved soon, so that the installation will be easier. To provide a way to organize my bookmarks in a powerful way. I tried a lot of existing bookmarking services, and I wasn't satisfied by any of them, for a variety of reasons. Let me elaborate on the organization part first. The simplest way to organize bookmarks is to introduce folders to group them. This still poses a well-known problem though: some bookmarks can logically belong to multiple folders. In order to address this issue, some services use tags: now we can tag a bookmark with more than one tag. So far so good. Now, assume I have a generic tag programming, and a couple of more specific tags: python and c. I definitely want my bookmarking service to be smart enough to figure that if I tag some article with either python or c, it means programming as well; I don't want to add the tag programming manually every single time. So, what we need is a hierarchy of tags. Surprisingly enough, I failed to find a service which would support that. 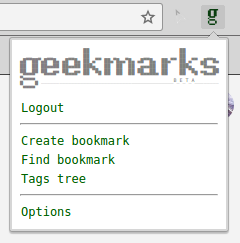 This hierarchical tags thing was a major motivation for me to start Geekmarks. Another important thing is that I want bookmarking service to be very quick to use. I don't want to go through these heavy user interfaces and look at all the eye candy. In my daily life I just want to either add a bookmark or find one, and I want to do that quickly: like, just a few keystrokes, and I'm done. And last but not least, I love open-source. So, meet Geekmarks! A free, open-source, API-driven bookmarking service. Now, on any page you want to bookmark, click "Create bookmark" from the menu (or use a hotkey; I personally use Shift+Ctrl+B), enter tags for your new bookmark, and save it. Tags which don't yet exist will be created on the fly. Please read the article for more details.